Gobi 65 recipe / cauliflower 65 – most frequently ordered starter in restaurants for a veg platter. It is one of the interesting recipes to have at any time. If we can able to make crispy and spicy gobi 65 recipe like restaurants at home, with simple ingredients available at our pantry, then what to hesitate to make our evening snack. 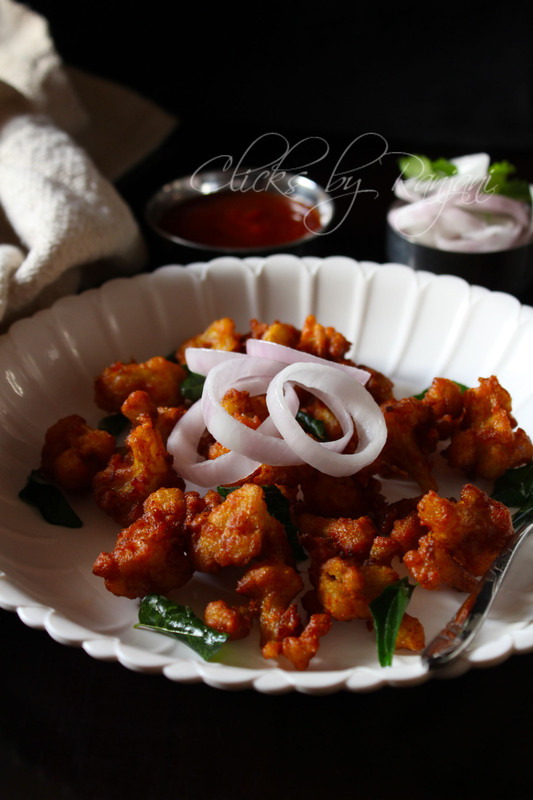 Here is easy and delicious gobi 65 recipe with stepwise pictures. Chop cauliflower equal sized pieces. Wash in tap water. Boil enough water to soak cauliflower. Once it starts boiling add cauliflower and allow to boil for 3 mins. Once the cauliflower is half cooked, completely drain the water and allow to cool completely. In a mixing bowl , add the ingredients given under “ to marinate” which includes corn flour, red chili powder, garam masala, turmeric powder, thick curd, cooking soda,ginger garlic paste and salt. Mix well to a thick paste consistency. Add half a cooked cauliflower in it. 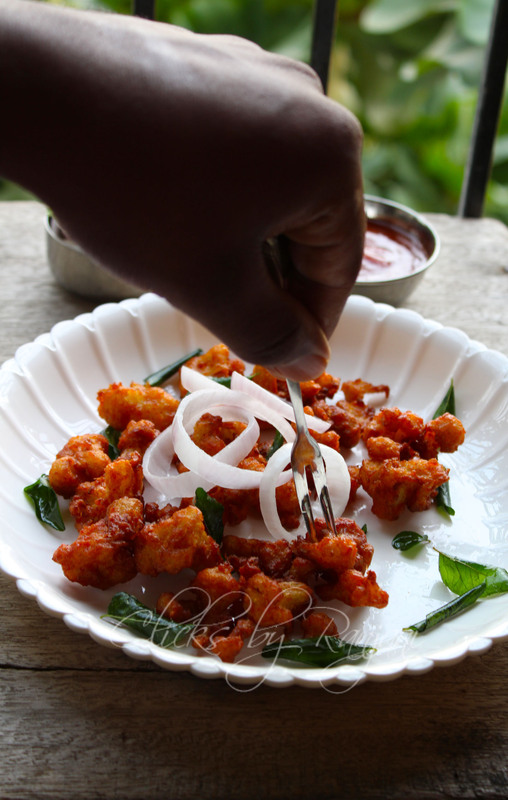 Mix well to coat the cauliflower with masalas. Let it sit for 15 mins. After 15 mins of marination, heat enough oil in kadai to fry the gobis. Once the oil gets heated, keep the flame medium low. 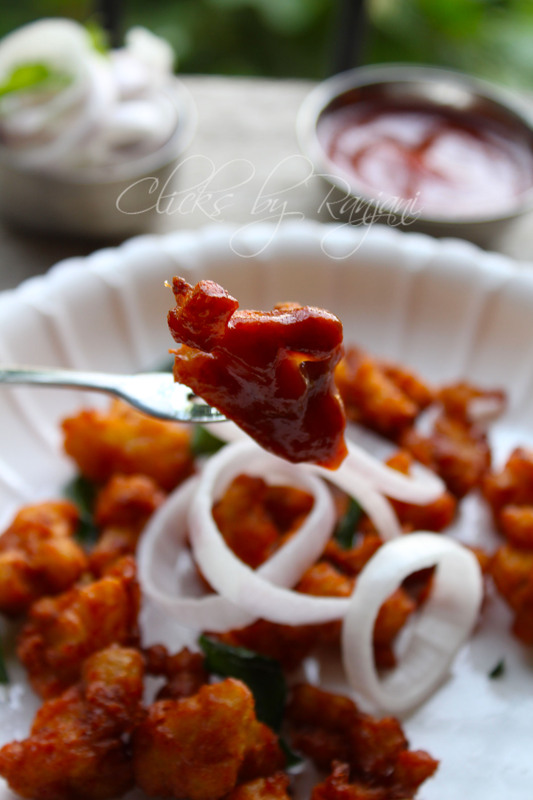 Fry cauliflower in small batches, drain the oil completely and place it in a kitchen towel. chop cauliflower and half cook in enough water. once half cooked, drain the water completely and cool down. In a mixing bowl , add the ingredients given under “ to marinate” which includes corn flour, red chili powder, garam masala, turmeric powder, thick curd, cooking soda,ginger garlic paste and salt. Mix well to a thick paste consistency. Add half a cooked cauliflower in it. Mix well to coat the cauliflower with masalas. Let it sit for 15 mins.